Harold Sever died before 2014. (?) Knutsen married Cheryl Renee Jenaman, daughter of Charles Joseph Jenaman and Mary Margaret Curran. Baby boy Jenaman died in 1967. He was born in 1967. He was the son of Charles Joseph Jenaman and Mary Margaret Curran. James Curran was the son of Bill Curran and Francis Eilers. James Curran died before 2014. Catherine Curran was the daughter of Bill Curran and Francis Eilers. Catherine Curran married Dr. Joe Wagner. Catherine Curran died before 2014. Dr. Joe Wagner married Catherine Curran, daughter of Bill Curran and Francis Eilers. Dr. Joe Wagner died before 2014. Name Variation Terrene Curran was also known as Duncalf adopted name. Terrene Curran was the son of Bill Curran and Francis Eilers. Terrene Curran died before 2014. Raymond J. Jenaman was born on 9 April 1978 at Iowa. He died on 16 January 2013 at age 34 Raymond J. Jenaman, age 34, of 1984 Hummingbird Dr., passed away on Wednesday, January 16, 2013. Funeral services will be at 10:00 a.m. on Monday, January 21, 2013, at the Church of the Nativity, 1225 Alta Vista, with Deacon David McGhee officiating. To celebrate Raymond's life friends may visit from 1:00 p.m. until 5:00 p.m. on Sunday, January 20, 2013, at Behr Funeral Home, 1491 Main Street. Interment will be in Linwood Cemetery. Raymond was born on April 9, 1978, in Dubuque, Iowa, son of Charlie and Candace "Candi" (Noonan) Jenaman. Raymond loved spending time with his family, especially his children Aidan and Addison. He was employed as the manager at Houlihan's Restaurant since 2005. Raymond enjoyed being in the great outdoors, fishing, camping, canoeing and hiking at the Mines of Spain. He liked to spend time looking for treasure with his metal detector, collecting coins and playing video games. He was a handyman who could fix anything. He loved to play jokes and make people smile. Raymond was a generous, kind hearted man and would go out of his way to help others. Raymond is survived by his children Aidan and Addison Jenaman, Dubuque, IA; his former wife Sara (Oberhoffer) Jenaman, Dubuque, IA; his parents, Charlie and Candace "Candi" Jenaman, Dubuque, IA; his siblings Billy (Brooke) Pitzer, Dubuque, IA, Jenny Jenaman, West Bend, WI, Charlie "Tuna" Jenaman, Dubuque, IA, Carrie (fiancé Jesse Frommelt) Jenaman, Dubuque, IA, Cory Jenaman, Dubuque, IA; his nieces and nephews Abe, Tony, Tyler, Susie, Landen, Riley, Carson and Ava; his grandparents Mary Jenaman, Bill and Shirley Harry; his best friend Nick Carner; several aunts and uncles. Raymond was preceded in death by his grandfathers Charles Jenaman and William Noonan and a brother in infancy Charles R. Jenaman. A memorial fund has been established for his children Aidan and Addison Jenaman. Online condolences may be left for the family at www.behrfuneralhome.com. William Noonan died before 2013. Charles R. Jenaman died at died in infancy. George Wagner married Dorothy Wingate. Dorothy Wingate married George Wagner. William I. Fure married Mary Ellen Linden, daughter of (?) Linden. William I. Fure was born circa 1893. 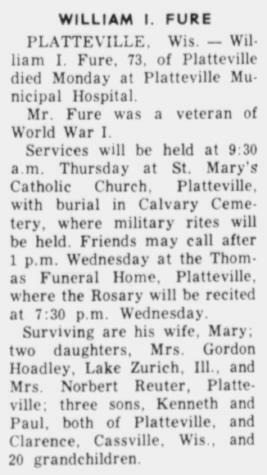 He died in December 1966 at at hospital, Platteville, Grant, Wisconsin, William I. Fure obituary. Married Name Her married name was Fure. Mary Ellen Linden married William I. Fure. Mary Ellen Linden was born on 4 June 1896. She was the daughter of (?) Linden. Mary Ellen Linden died on 13 February 1975 at age 78 Mary Ellen (Linden) Fure obituary. Paul Fure was born on 15 October 1931 at Platteville, Grant, Wisconsin. He was the son of William I. Fure and Mary Ellen Linden. Paul Fure died on 21 May 2017 at age 85 Paul W. Fure, 85, of Platteville, died on Sunday May 21, 2017 at his home. Friends may call from 5:00 – 7:00 p.m. Friday, May 26, 2017 at the Melby Funeral Home & Crematory, Platteville where Military Rites will be accorded by American Legion Post #42 and VFW Post #5274. Burial will be at Calvary Cemetery, Platteville, at a later date. Memorials may be made to the Paul W. Fure Memorial Fund. Paul was born on October 15, 1931 in Platteville, the son of William and Mary Ellen (Linden) Fure. He was united in marriage to Donna Hughes on February 11, 1956 in Platteville. He worked at John Deere Dubuque Works for 30 years where he was a welder. He enjoyed hunting, fishing, trapping, playing cards. Paul always enjoyed winning at the casino. Paul is survived by his wife, Donna, of Platteville; four children, Jeff Fure, Kris (Mary) Fure, Rick (Lisa) Fure, Lynn Fure; nine grandchildren; seven great-grandchildren many nieces and nephews. He was preceded in death by his parents; daughter, JillAnn in infancy; sisters, Mary Reuter and Florence Hoadley; brothers, Clarence and Kenneth Fure. Name Variation Francis Kenneth Fure was also known as Kenny. Name Variation Francis Kenneth Fure was also known as Kenneth. Francis Kenneth Fure was born on 13 August 1929. Francis Kenneth Fure married Joan Leyh on 18 September 1956. Francis Kenneth Fure died on 4 August 2016 at age 86 Francis Kenneth “Kenny” Fure, passed away on Thursday, August 4, 2016 at Manor Care Health Services, Platteville. Mass of Christian Burial will be 10:30 a.m. Monday, August 8, 2016 at St. Mary’s Catholic Church, Platteville. Burial will be at Calvary Cemetery, Platteville, where military rites will be accorded by VFW Post #5274 and American Legion Post #42. Father Alex Navarro will officiate. Friends may call from 3:00 – 5:00 p.m. Sunday, August 7, 2016 at the Melby Funeral Home & Crematory, Platteville, where there will be a parish rosary at 2:45 p.m. Friends may also call from 9:30 a.m. until the time of service on Monday, at the church. Memorials may be made to the Francis Kenneth “Kenny” Fure Memorial Fund. Kenny was born prematurely and at home on August 13, 1929 to William and Mary Ellen (Linden) Fure. As the family story goes, the doctor who delivered him told his parents that if he was alive yet at noon to let him know. Kenny was so small at birth that his father could slide his wedding ring all the way up his arm to his shoulder. His Grandmother Linden kept him warm by filling Mason jars with hot water and placing them around the shoe box that served as his bassinette. Kenny graduated from Platteville High School in 1949. He enlisted in the United States Air Force on October 12, 1950 and was given a hardship discharge on June 18, 1954 so he could take care of the family farm after his father fell ill. Kenny married Joan Leyh on September 18, 1956. He and Joan farmed in the area for 8 years until Kenny began working for the Wisconsin State University – Platteville as a maintenance mechanic; he eventually was promoted to electrician and retired in 1989. Kenny was a loving father, grandfather, great-grandfather, husband, uncle, and brother. He absolutely loved to hunt deer and turkey and go fishing. He and his brothers and younger sister made annual fishing trips up north for many years. He loved to tinker and could build or fix anything. He also volunteered at St. Mary’s Parochial School for many years, performing electrical work and other maintenance at no charge. 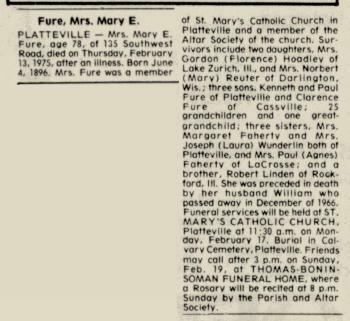 Kenny is survived by his brother, Paul (Donna) Fure of Platteville; sisters-in-law, Ida Fure of Cassville, WI and Joyce Novinski of Edmund, WI. He is also survived by five children, Linda (William) Koepcke of Verona, WI; Lawrence (Diane) Fure, of Belmont, WI; Karen (Joseph) Hammes of Waukesha, WI; Stan Fure of Madison; and Chris (Nate Williams) Fure of Fridley, MN; six grandchildren, Mike Fure, Matt Fure, Aimee (Jamin) Arn, Ryan Murray, and Alyssa and Jenna Hammes; one step-granddaughter, Christina (Jeff) Liepins; one step-grandson, Raymond Koepcke; nine great-grandchildren, Simon, Christian, Joshua, Collin, Jacob, Kaitlyn, Autumn, Hunter, and Jake; and many nieces and nephews. He was preceded in death by his parents; wife, Joan; sisters, Florence Hoadley and Mary Reuter; brother, Clarence Fure; two infant sons, Wayne and Kevin; and granddaughter, Kayla Hammes. Clarence Fure was born on 6 January 1934. Clarence Fure married Ida Mae Reuter, daughter of E. Lester Reuter and Mildred M. Pitzen, on 31 July 1954. Clarence Fure died on 17 July 2014 at age 80 Clarence J. Fure, age 80, of Cassville, passed away peacefully on Thursday, July 17, 2014, at UPH Finley Hospital in Dubuque, IA. He was born on January 6, 1934, in Platteville, the son of William and Mary (Linden) Fure. Clarence grew up on the family farm near Platteville. He served in the United States Army and was united in marriage on July 31, 1954, to Ida Mae Reuter. Clarence retired from John Deere after thirty plus years. He enjoyed hunting, fishing, playing cards with the guys and spending time with his family. Clarence was an avid Green Bay Packer fan and loved his Milwaukee's Best. He was a member of St. Charles Catholic Church and the American Legion Post No. 352 of Cassville. Survivors include his loving wife, Ida Mae Fure, Cassville; their children: Victoria (Gary) Yunk; Michael (Marcia) Fure; David (Lori) Fure; William Fure, all of Cassville; Lisa (Michael) Rauch, Evansville; Robin (Luke) Demes; Richard "Ernie" (Chrystal) Fure; Michele (Brian) Bierman, all of Cassville; twenty-one grandchildren; seventeen great-grandchildren; one great-great-grandchild on the way; his siblings: Florence Hoadley, Francis "Kenny" (Joan) Fure, and Paul (Donna) Fure all of Platteville; other relatives and many friends. In addition to his parents, Clarence was preceded in death by a son, Ronald Lee Fure; a sister, Mary Reuter; and his brothers-in-law, Norbert Reuter and Gordon Hoadley. A Mass of Christian Burial was held on Monday, July 21, 2014, at 10:30 a.m. at St. Charles Catholic Church in Cassville with Father John Meinholz officiating. Burial with military honors was held in St. Charles Cemetery, Cassville. Family and friends called on Sunday, July 20, 2014, from 3:00 p.m. until 7:00 p.m. at Martin Funeral Home & Cremation Services in Cassville where a 2:45 p.m. scripture service will be held. Friends also called on Monday from 9:30 a.m. until 10:30 a.m. at the funeral home. Married Name Her married name was Reuter. Mary Fure was the daughter of William I. Fure and Mary Ellen Linden. 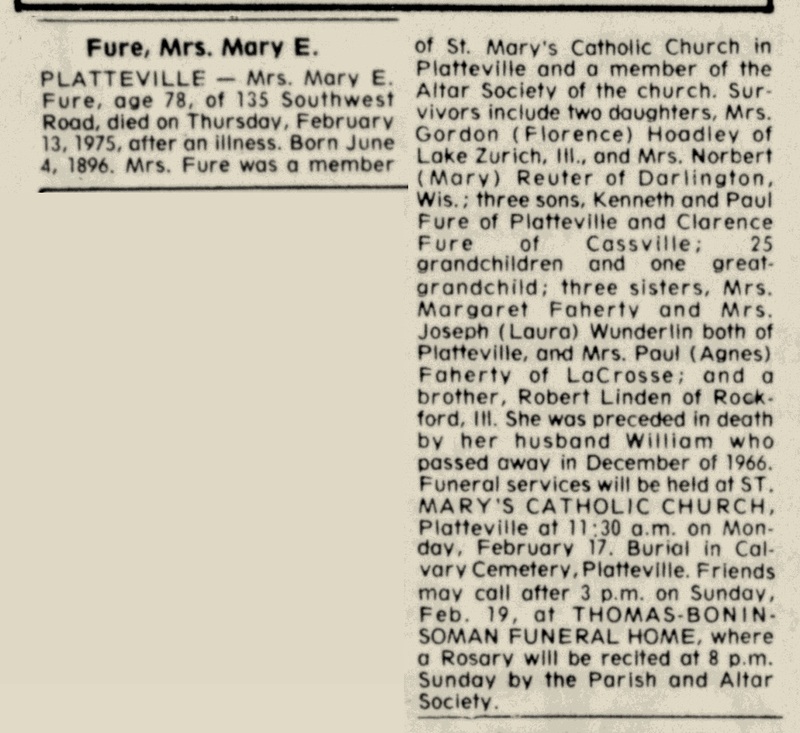 Mary Fure married Norbert Reuter, son of E. Lester Reuter and Mildred M. Pitzen. Mary Fure died before 2014. Norbert Reuter was the son of E. Lester Reuter and Mildred M. Pitzen. Norbert Reuter married Mary Fure, daughter of William I. Fure and Mary Ellen Linden. Norbert Reuter died before 2014. Brian McClain was born on 23 March 1952 at Dubuque, Iowa. He was the son of LeRoy Joseph McClain and Marian Elizabeth Bogue. Brian McClain died on 14 May 2010 at age 58 Brian Jerome McClain , 58, of Olin, Iowa, formerly of Dubuque, died, Friday, May 14, 2010, in rural Olin. A memorial luncheon will be from 1 to 3 p.m. today at Hale Tap for family and friends. The family has honored his wishes and cremation rites have been accorded. The Lahey Funeral & Cremation Services, Olin, is in charge of arrangements. He was born on March 23, 1952, in Dubuque, son of Le Roy and Marian (Bogue) McClain . He graduated from Dubuque Senior High School. Brian served in the Marine Corps during peace time. He was a truck driver for many years for several trucking firms. Brian was a member of the Abate Motorcycle Club and NRA. Surviving are his ex-wife whom he resided with, Patricia McClain , of Olin; his children, Christy Lynne McClain , of Washington, Mandy (Jason) Soper, Brianne (Matt Walshire) McClain and Samantha (Marshall Bassett) McClain , all of Olin; a stepdaughter, Becky (Nathaniel) White, of Colesburg; 11 grandchildren; and two brothers, Mike (Jan) McClain , of Cassville, Wis., and Kevin McClain , of Dubuque. He was preceded in death by his parents, grandparents and a sister, Patty. Fred J. Rupp was born on 18 August 1888 at Iowa also reported as Aug 1889. He was the son of John Rupp and Gertrude Byer. Fred J. Rupp married Elizabeth Beckman on 16 January 1912 at Calmar, Iowa. Fred J. Rupp died on 27 June 1960 at age 71. He was buried after 27 June 1960 at Mount Calvary Cemetery, Cherokee, Cherokee, Iowa. Fred J. Rupp lived in 1928 at Cherokee, Iowa. [S245] U.S. Federal Census 1900 U.S. Federal Census, by Ancestry.com, ED21. Dwelling 180. Name Variation Bessie Irene Ryan was also known as Elizabeth Bessie. Married Name 9 April 1913 As of 9 April 1913,her married name was Rupp. Bessie Irene Ryan was born on 13 January 1891 at Quimby, Cherokee, Iowa. She married Peter John Rupp, son of John Rupp and Gertrude Byer, on 9 April 1913 at Ime. Con. Church, Cherokee, Cherokee, Iowa. Bessie Irene Ryan died on 22 November 1972 at Cherokee, Iowa, at age 81. She was buried after 22 November 1972 at Mount Calvary Cemetery, Cherokee, Cherokee, Iowa. Name Variation Bertille Catherine Rupp was also known as Bertelle. Married Name 24 July 1937 As of 24 July 1937,her married name was Walstead. Bertille Catherine Rupp was born on 15 July 1916 at Cherokee, Iowa. She was the daughter of Fred J. Rupp and Elizabeth Beckman. Bertille Catherine Rupp married Melvin Walstead on 24 July 1937 at LeMars, Iowa. Bertille Catherine Rupp died on 4 March 2004 at age 87. Melvin Walstead was born circa 1911 at Iowa. He married Bertille Catherine Rupp, daughter of Fred J. Rupp and Elizabeth Beckman, on 24 July 1937 at LeMars, Iowa. Name Variation Alphonse Emil Kaufmann was also known as Al. Alphonse Emil Kaufmann was born in June 1863 at Illinois also reported as 1859. He married Mary Ann Kearney, daughter of (?) Kearney, on 22 November 1892. Alphonse Emil Kaufmann died on 25 November 1924 at age 61 Alphonse Emil Kaufmann, for 20 years custodian of the court house, died at Mercy Hospital on Tuesday afternoon at 3:30 o'clock after a few weeks illness. He was removed from his home to the hospital a week ago in the realization that his condition was critical and in the hope that he might so far improve in health as to admit an operation but the hope was in vain. The deceased was the son of the late Andrew and Kathryn Pfiffner Kaufmann, early settlers of Dubuque. He was a widower, his wife preceding him in death 21 years ago. She was Mary Ann Kearney, and was married on November 22, 1892. The surviving members of the family are Leo A., Clement J., Sylvia M., Gertrude M., and Alphonse Jr. Kaufmann, all residing in Dubuque, and two brothers, Robert and Andrew, also of Dubuque. He was a member of several organizations, among them the St. Aloysius Society, the Knights of Columbus and the Woodmen of the World. The funeral will be held on Friday morning at 9 o'clock from the residence, 568 Seminary Street, to St. Patrick's Church and thence to Mt. Calvary. Expressions of regret at the passing of Alphonse Kaufmann were general and sincere among the officials at the court house as, indeed, they were wherever he was known. His faithful service of twenty years, coupled with his fine character, made his tenure of public place secure from the changed of politics. Dubuque Telegraph Herald November 11, 1924. [S245] U.S. Federal Census 1900 U.S. Federal Census, by Ancestry.com, Year: 1900; Census Place: Julien, Dubuque, Iowa; Roll: 430; Page: 4B; Enumeration District: 0112; FHL microfilm: 1240430. [S244] U.S. Federal Census 1910 U.S. Federal Census, by Ancestry.com, Year: 1910; Census Place: Dubuque Ward 4, Dubuque, Iowa; Roll: T624_402; Page: 5A; Enumeration District: 0129; FHL microfilm: 1374415. Leo Andrew Kaufman was born on 2 November 1893 at Iowa also reported as Nov 1894. He was the son of Alphonse Emil Kaufmann and Mary Ann Kearney. Leo Andrew Kaufman married Mary Lackey on 30 August 1927 at Dubuque, Iowa. 1 January 1925 Dubuque Precinct 10, Dubuque, Iowa Leo Andrew Kaufman appeared on the census of 1 January 1925 in the household of Mary G. Rupp at Dubuque Precinct 10, Dubuque, Iowa; with sister-in-law's children. Name Variation Clement Joseph Kaufman was also known as Joseph Clem. Name Variation Clement Joseph Kaufman was also known as Clem Joseph. Clement Joseph Kaufman was born on 27 August 1895 at Iowa. Clement Joseph Kaufman died on 7 January 1961 at Florida at age 65. 1 January 1925 Dubuque Precinct 10, Dubuque, Iowa Clement Joseph Kaufman appeared on the census of 1 January 1925 in the household of Mary G. Rupp at Dubuque Precinct 10, Dubuque, Iowa; with sister-in-law's children. Name Variation Sylvia Maria Kaufman was also known as Silvia M.
Sylvia Maria Kaufman was born on 12 December 1898 at Dubuque, Iowa. She was the daughter of Alphonse Emil Kaufmann and Mary Ann Kearney. Sylvia Maria Kaufman died on 22 March 1986 at age 87. 1 January 1925 Dubuque Precinct 10, Dubuque, Iowa Sylvia Maria Kaufman appeared on the census of 1 January 1925 in the household of Mary G. Rupp at Dubuque Precinct 10, Dubuque, Iowa; with sister-in-law's children. [S250] U.S. Federal Census 1930 U.S. Federal Census, by Ancestry.com, Year: 1930; Census Place: Julien, Dubuque, Iowa; Roll: 654; Page: 2A; Enumeration District: 0031; Image: 113.0; FHL microfilm: 2340389. Name Variation Mary Gertrude Kaufman was also known as Gertrude Mary. Mary Gertrude Kaufman was born in 1901 at Iowa. Mary Gertrude Kaufman died on 13 December 1984. 1 January 1925 Dubuque Precinct 10, Dubuque, Iowa Mary Gertrude Kaufman appeared on the census of 1 January 1925 in the household of Mary G. Rupp at Dubuque Precinct 10, Dubuque, Iowa; with sister-in-law's children. Name Variation (?) Kearney was also known as Kerney.